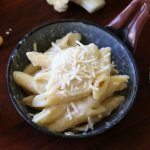 I know, Mac and Cheese is the most popular kids comfort food ever. 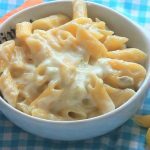 Soft, cheesy, bite size, creamy, one bright color only: all reassuring and comforting qualities for a kid. 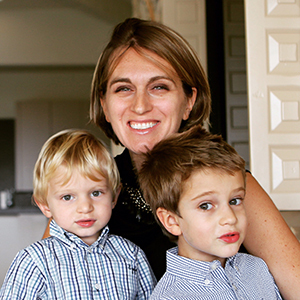 So…why not transforming the #1 kids comfort food into a mom’s favorite too?? Adding vegetables and nutrients I tried to keep the same qualities that the kids love: soft, cheesy, creamy, bite size, one bright color only. 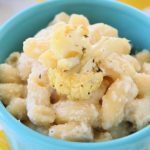 After few trials and some mistakes I’m so happy to share with you the Cauliflower Mac and Cheese recipe that has been 100% approved by my kids. 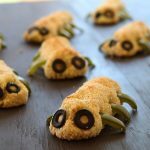 Also, it’s a lovely idea for a kids party! 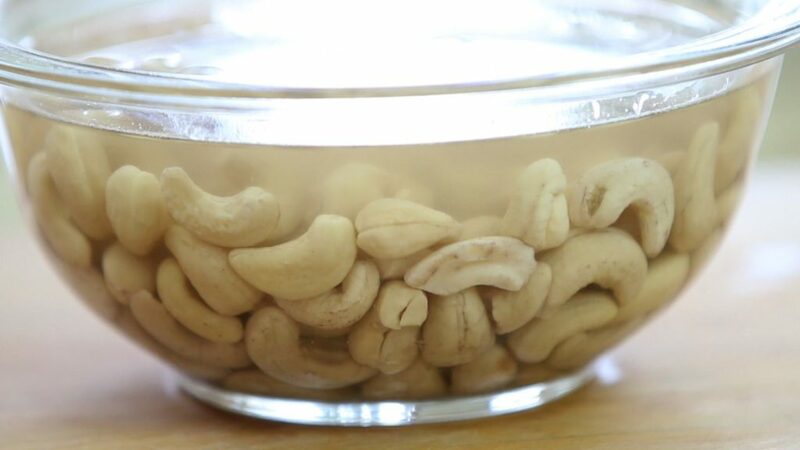 You start soaking the cashews in water overnight or at least for few hours. 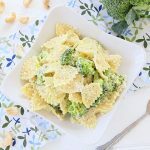 Through the years I learned that planning the meal plan for the following day the night before saves me a lot of time and stress. After cleaning the kitchen after dinner, lunch boxes ready in the refrigerator, I simply have a look at what’ inside the fridge and think about the next day dinner (we all eat lunch separately during the week) so that if I need to prep something ahead I know it (like soaking legumes overnight). 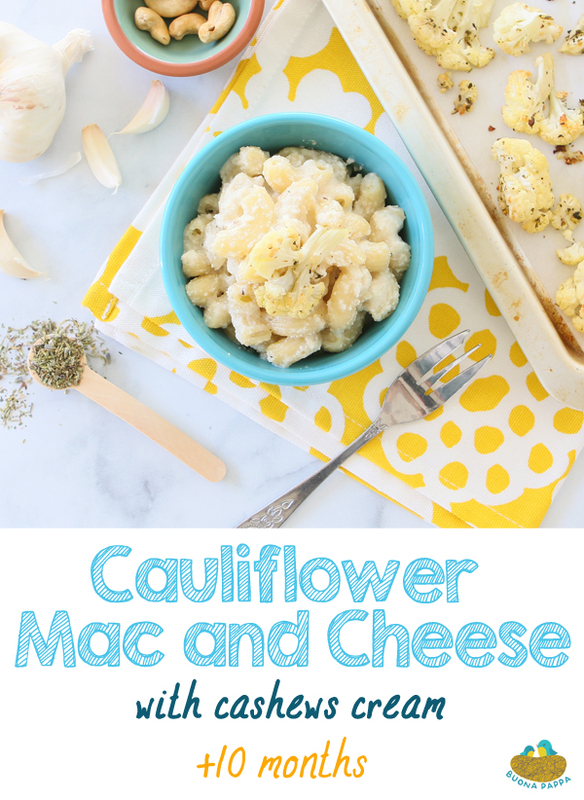 When it’s time to prepare the Mac and Cheese, wash the cauliflower, cut it in half and remove the florets from the head. Slice the florets in 1/2 inch thick slices. 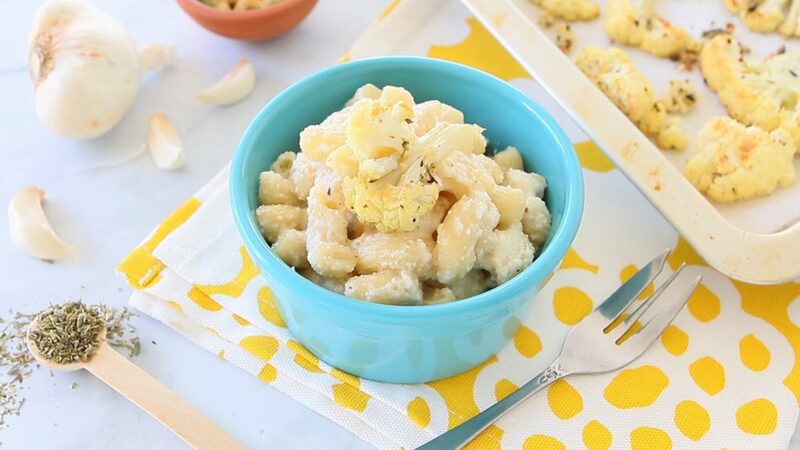 Place the cauliflower on a baking sheet lined with some parchment paper. Add the garlic cloves and drizzle with some Extra Virgin Olive oil. 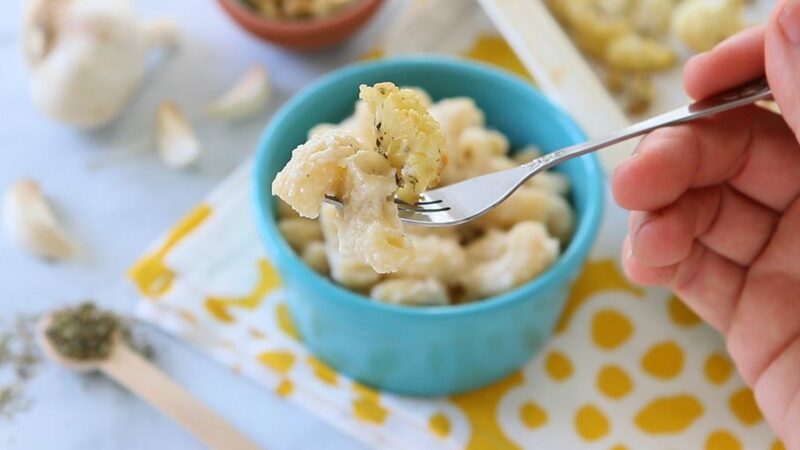 Adjust with salt and sprinkle few teaspoons of herbs de Provence. The mix I used is a lovely variety of thyme, marjoram, rosemary, basil, sage, lavender. You can create your own mix choosing between the mentioned herbs. 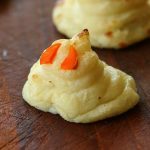 Turn the cauliflower florets to evenly coat them on each side. Roast in preheated oven to 400F 20min, mixing half way. Bake in broil mode additional 5min to caramelize and get that lovely golden color. Meanwhile prepare the pot full of water for the pasta. When the water is boiling add 1 Tbsp of sea salt and the pasta. Cook following the cooking time on the packaging. 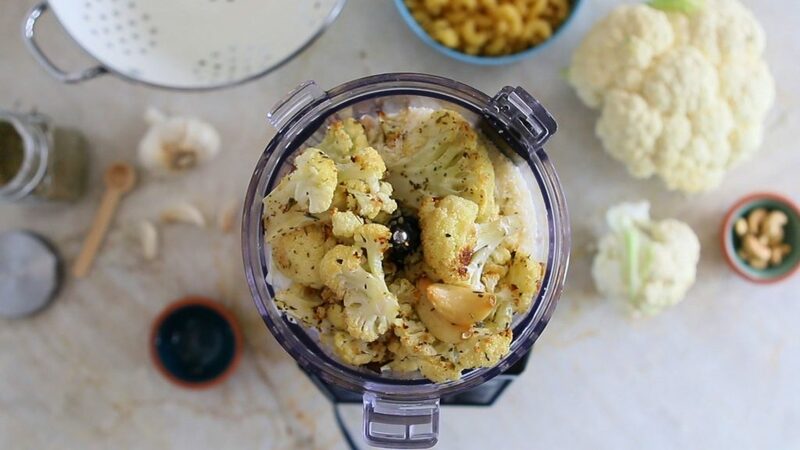 In a food processor add the drained cashews + the yogurt + parmesan cheese + pinch of salt + hemp seeds + 3/4 of the roasted cauliflower. 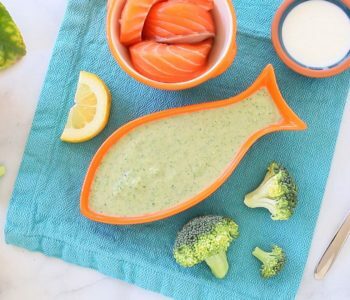 I added hemp seeds as they are a lovely source of Omega 3 and 6, brain fuel for our kids! 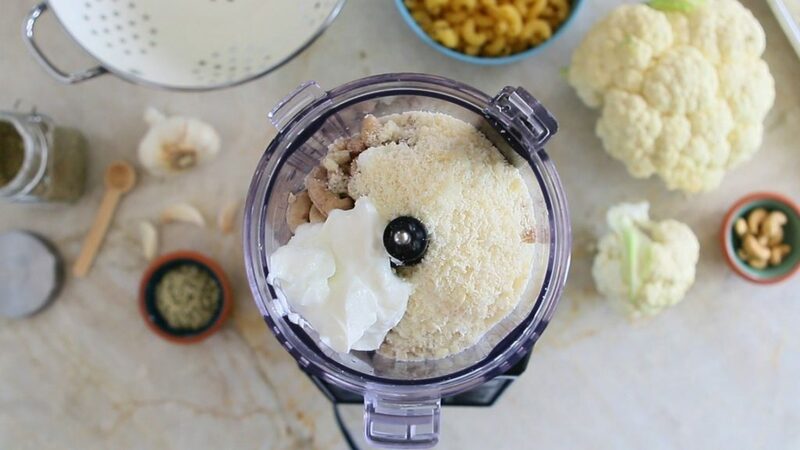 Also, cashews will provide a nice amount of protein to the recipe. Also add into the blender 1 cup from the boiling water from the pasta. 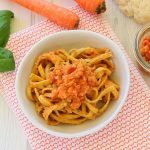 You can also add hot water, but the boiling water from the pasta contains some of the pasta starch that will make our sauce creamier. Pulse in order to obtain a smooth cream. 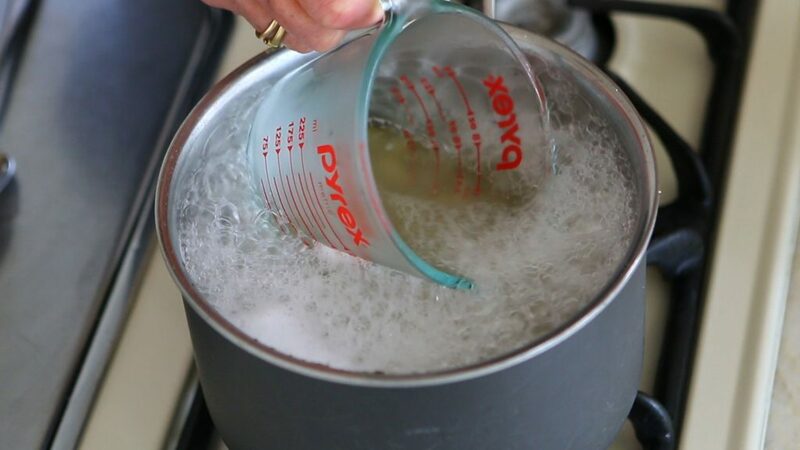 Drain the pasta and reserve another cup of the boiling water to thin the sauce as needed. 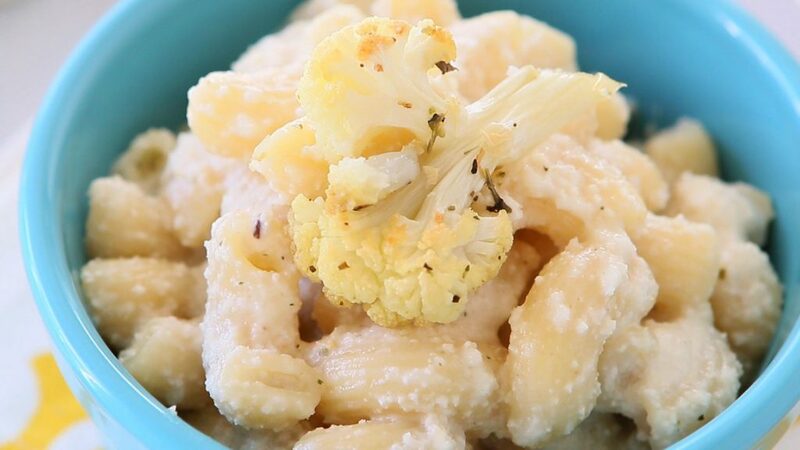 Combine the pasta with the cauliflower cheesy cream and top with the remaining roasted cauliflower. 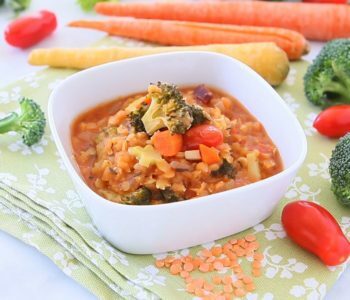 Use the boiling water to adjust the consistency of the sauce. Serve warm. 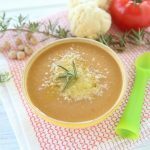 If you prepared more sauce than needed, you can store it in the refrigerator for up to 3 days or freeze it for up to 3 months. 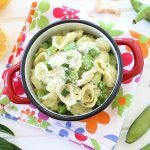 If you have some pasta already dressed leftovers you can store them in the refrigerator for one day. 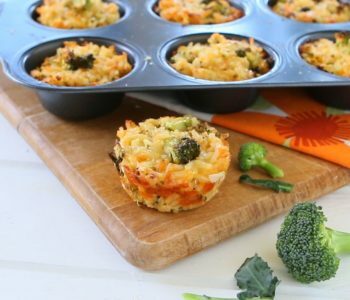 I would not suggest to freeze it: you will totally lose the texture. Soak the cashews in water overnight or at least for few hours. 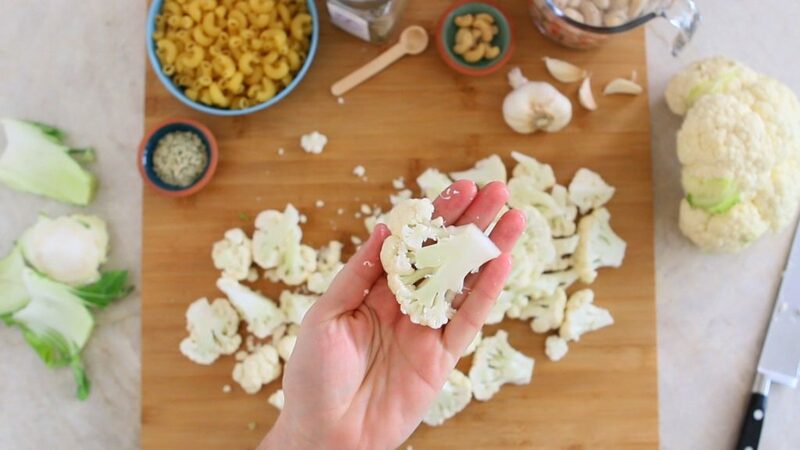 Wash the cauliflower, cut it in half and remove the florets from the head. Slice the florets in 1/2 inch thick slices. 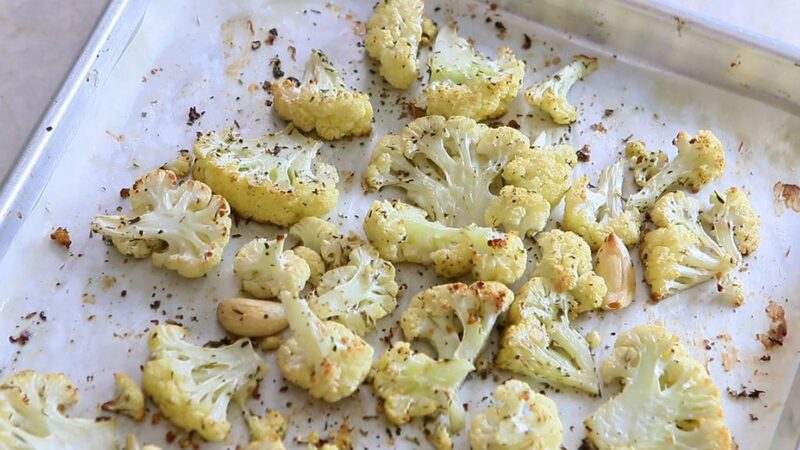 Place the cauliflower on a baking sheet lined with some parchment paper. Add the garlic cloves and drizzle with some Extra Virgin Olive oil. 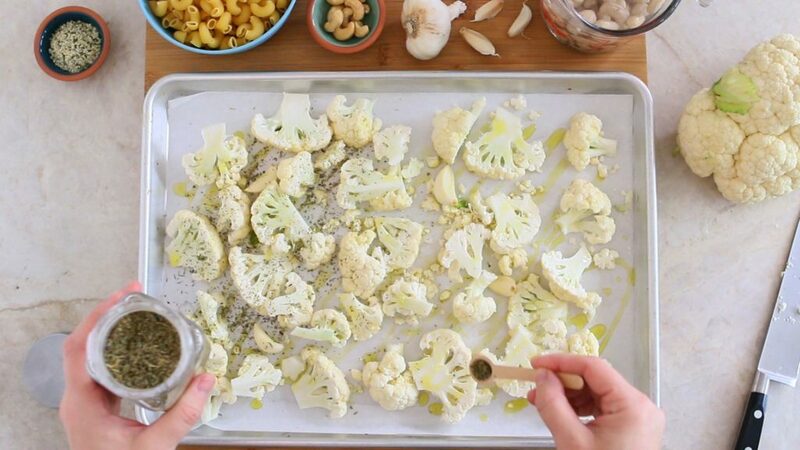 Adjust with salt and sprinkle few teaspoons of herbs de Provence. 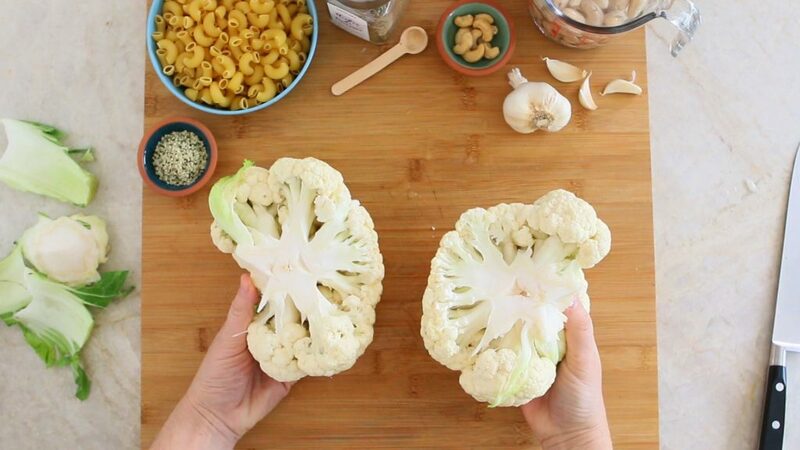 Turn the cauliflower florets to evenly coat them on each side. Prepare the pot full of water for the pasta. When the water is boiling add 1 Tbsp of sea salt and the pasta. Cook following the cooking time on the packaging. 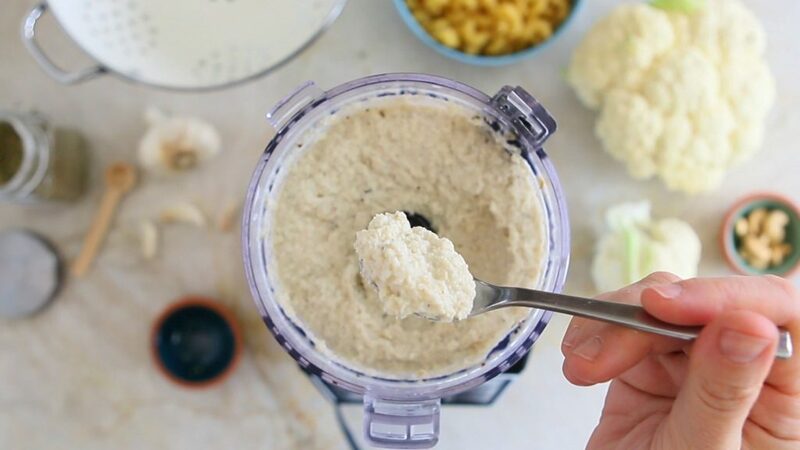 In a food processor add the drained cashews + the yogurt + parmesan cheese + pinch of salt + hemp seeds + 3/4 of the roasted cauliflower + 1 cup from the boiling water from the pasta.